One of these I really am going to make real deal holy field cinnamon buns, especially since I’ve already managed to make homemade croissants and lived to tell the tale, but until that day comes I’m perfectly happy to indulge in shortcuts like cinnamon bun cookies or, dare I say it, cinnamon bun donuts. It’s no secret that I love baked donuts, probably way more than I should, and I’m always trying to think of new ways to make them – kind of like how I’m always thinking I really should stop stalling already and make cinnamon buns from scratch. Create a new shortcut and marry the two ideas. I’m sure my donut pan is loving all this extra attention. Now that I’m experimenting more while I’m in the kitchen, it’s funny how a recipe develops and takes shape. 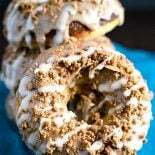 Like for example: I knew I wanted cinnamon donuts, so I found a solid plain donut recipe and added some cinnamon. But then I wanted more cinnamon, so I made a cinnamon glaze. And then I wanted cinnamon crumbly goodness on top, so I tracked down a quick (and kind of fun) recipe for that. And finally I wanted to add a splash of color, so I drizzled a very simple vanilla frosting over all of it. Did you ever read the book “If You Give a Mouse a Cookie” as a kid? It seems my whole cooking strategy is based entirely around that. Another perk of this recipe: these donuts baked the most and fully of any I’ve ever made, so I can foresee this being a foundation recipe I’ll use going forward for all my future donut endeavors. … Of which I’m sure there will be plenty, as it seems my solution to get around preparing elaborate breakfasts is just to make a donut version of it. But that’s not a bad thing, right? Preheat oven to 350 degrees F. Spray a donut pan with non stick cooking spray. In a large mixing bowl, sift together all-purpose flour, cornstarch, baking powder, cinnamon, sugar, and salt. Set aside. In a small bowl, whisk together buttermilk*, egg, and melted butter. Pour wet ingredients into dry ingredients, whisking together until there are no longer any clumps. For filling the donut pan, use a pastry bag or a Ziploc bag with the corner cut to pipe the batter into the pan. Fill the donuts about 2/3 full or until all batter is used. Bake in the oven for 7-9 minutes or until stop of donuts are puffy and appear dry. Remove from oven and allow to rest for 2 minutes in the donut pan, then transfer to a wire cooling rack to cool completely. In a large bowl, mix flour, brown sugar, and cinnamon. Add softened butter and mash with your fingers. Begin mashing the butter into the dry ingredients. Continue to combine until you can pick up all ingredients in your hands. Squeeze dough together to pack everything together. Once dough is smooth and firm, begin pinching the dough within your fingers so that it breaks apart into small pieces. Set aside. In a wide bowl, whisk together milk, sugar, and cinnamon. Set aside. In a small bowl, whisk together milk, sugar, and vanilla. Pour icing into a pastry bag with a small tip or in a Ziploc bag with the corner cut out. Set aside. 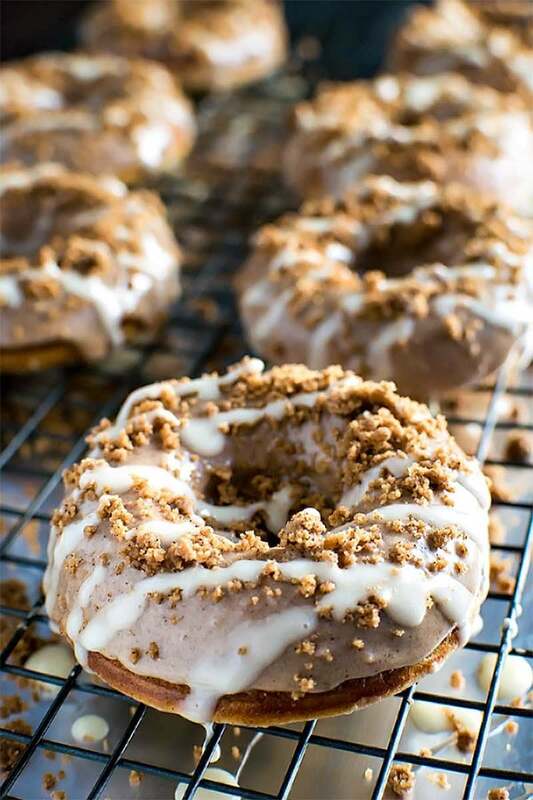 Dip cooled donuts in cinnamon icing. Quickly sprinkle cinnamon crumble topping on top so that it sticks to the cinnamon frosting. Allow donuts to dry for 15 minutes, then drizzle vanilla frosting on top of the donuts. Let donuts dry for another 15-20 minutes before eating. * * If you don't have any buttermilk, you can make your own. Using a measuring cup, pour in 1 and 1/2 teaspoons of either lemon juice or vinegar. Then pour milk in the measuring cup, going up to 1/3 cup. Stir and let mixture sit for 5 minutes, then use as buttermilk in the recipe. Cinnamon crumble recipe from Cookstr. Cinnamon donut recipe adapted from Table For Two. These look amazing! I totally feel the same way about “If you give a mouse a cookie” kind of cooking. Always feel I need to do more or make it better somehow. Ahh… it’s both terrible and amazing all at the same time! Isn’t it, though? Thank you Jennifer! Thank you Ashley! I was wondering if anyone else had read that book 😀 It seems to be a perfect fit these days. Now THIS is how I want to do breakfast! They look fantastic! Way to indulge my weakness for donuts and make me feel better about it by baking them. The cinnamon bun bit? Genius. Well done. I have not made homemade donuts before but these look so delicious. 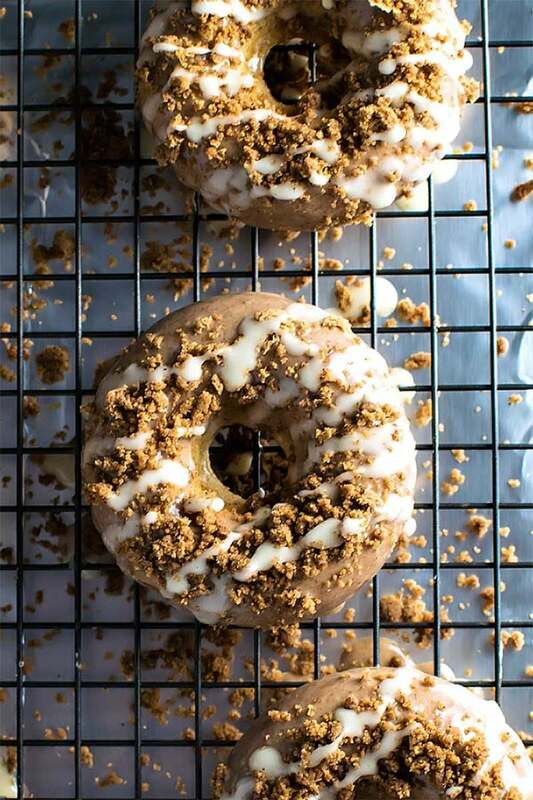 My son goes crazy for donuts so I think we might need to try making these. I love that topping on these! 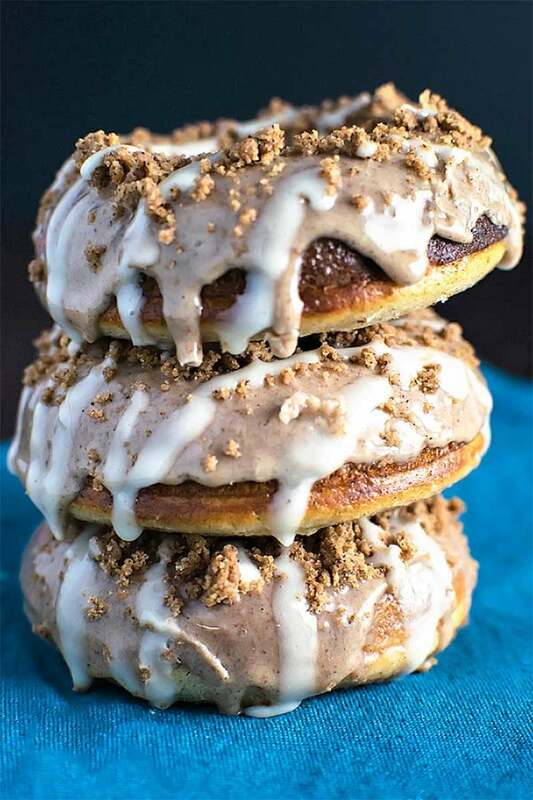 I noticed in the body of your post that you put cinnamon into the batter or the donuts, but in the recipe there’s no cinnamon listed. I tried to make these donuts this morning, but the batter was very thin and the donuts didn’t bake right or have much flavor at all. Is there something you would suggest changing? I looked over the recipe, and you’re completely right – the cinnamon was missing and I think the buttermilk amount was off as well. There were some updates to this site recently that had the consequence of modifying data on some of the recipes, and I *thought* I proofread them all… but apparently this one slipped past me 🙁 I’m so sorry! I wish I could buy you the ingredients all over again. I could see how the donuts wouldn’t turn out – the recipe had 3/4 buttermilk when it should have only been 1/3. Using 1/3 cup would have given you a fluffier, cake-like batter to work with (and a traditional donut flavor). I looked at the recipe you linked to that you got the recipe from, and made that one this morning and it turned out really well! I’m really excited to try this one again. i baked these for a breast cancer awareness bake sale at work. i had to go to the source recipe because, even though the cinnamon and sugar are listed on the donut ingredients, you omit them on the instructions, so my first batch taste like nothing 🙁 also, on the vanilla icing, you have cinnamon instead of vainilla on the instructions. on the other hand, the second batch turned out awesome and the bake sale was a success. So sorry the confusion on the recipe! I’m glad the second batch turned out better. I’ll fix the recipe right now, thank you for letting me know of the issues! Hey Misty! If you plan on decorating the donuts the night before, I’d recommend storing them in the fridge overnight in a sealed container. 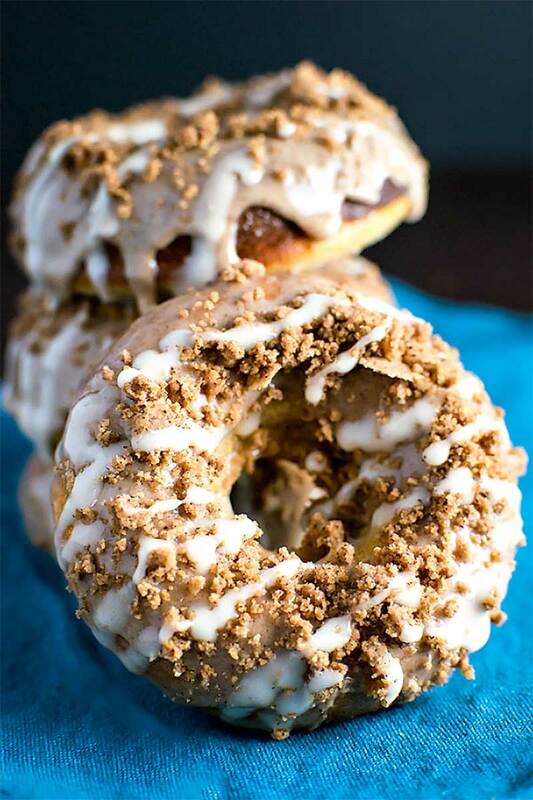 If you plan on decorating them the next morning (or even bringing the decorations to church, so people could decorate their own donuts) you can just store the baked parts (donuts and crumbles) in a sealed container on the counter and then store the frosting in the fridge. The frosting would need to be brought back to room temperature before using. These look amazing!! Your photos are making me hungry! I think I’ll make these for Christmas morning to go with the big breakfast I’m making! I think they’d be perfect. Btw- I noticed in your recipe notes about the buttermilk, it still says 3/4 cup- just thought I’d let you know since I’d want to know if it were me. 🙂 Thanks for the awesome recipe! Just made these and they were great. Had a friend over for coffee and he’d loved them. Some baked donuts are bland but not these. They are full of flavor. McCormick has a new roasted cinnamon that I used and it defiantly kicks the flavor up a notch.